Increase energy, reduce soreness, improve sleep quality, and ramp up heart health with Aggressive Strength Recovery Oil! Loaded with Magnesium, MSM. and Zinc. Increase energy, reduce soreness, improve sleep quality, and ramp up heart health with Aggressive Strength Recovery Oil! Loaded with Magnesium, MSM, and Zinc! * Finally back in stock! This is my second time ordering your recovery oil, and I feel like I can't say enough about how much it's helped my performance. Lifting in the morning, working all day, then going to MMA at night left me constantly fatigued, and I had difficulty staying awake and focused at work until I started using this product. The benefits were apparent within 2 days of using it. If there is one supplement I swear by, this is it! I sleep better at night and have energy all day. Mike Mahler's Recovery Oil is by far one of the best supplements I have come across over the last year. I work long hours as a trainer and also train 2 x a day, the recovery has always been a problem. I have attended Mike's seminar 3 years ago and I remembered him talking about the benefits of Magnesium oil. I bought some magnesium spray in one of the health shops and did use it for a couple of months afterward but didn't really notice any major change, so I stopped applying it. Last year my friend was raving about how good he felt using Mike's recovery oil and how it helped his recovery and sleep. I gave it another shot, this time I used Mike's product and I have noticed a difference within the first 2 weeks. I recover much better but what surprised me even more - the oil helped with my inflamed elbow tendon which is an old re-occurring injury. Usually, once the tendon gets inflamed I need to avoid any pushing movement for a couple of weeks and get acupuncture treatments. With the oil, which I sprayed on the elbow 2 x a day there was no need to have any additional treatment as it brought the inflammation down, also I still could train as usual. After 3 weeks, the inflammation was gone and my training didn't suffer at all. Thank you for putting such a great product on the market Mike. I have been using magnesium oil for years and absolutely love it! It is one of the most effective supplements I use and I recommend it to everyone across the board. Recently, I decided I wanted to have my own magnesium oil supplement under my label but I wanted to make it better than anything on the market. I am confident that I have done just that by adding zinc and MSM to the mix. Zinc is a powerful mineral that is very important for optimal testosterone production, prostate health, and immune system strength. A zinc deficiency can cut testosterone by 50% and many hard training athletes have serious zinc deficiencies. Zinc is also very important for women so this is definitely a product that both sexes can benefit from. MSM is a nice addition as well as it is very useful for joint health and reducing inflammation. Let's talk about one of the main ingredients in the recovery oil which is magnesium oil. One very important unique component of magnesium oil is that it increases DHEA levels big time and is an overall hormone optimizer. According to Dr. Carolyn Dean, author of The Magnesium Miracle, when magnesium is absorbed through the skin and underlying fatty tissues of the body it sets off many chain reactions, one of which ends in the production of DHEA. DHEA is a critical hormone for stress management and balancing the actions of the stress hormone cortisol. DHEA also acts as a backup reserve for testosterone production. Depleted levels of DHEA adversely affect testosterone levels. The hormone optimizing benefits of magnesium oil are not the only benefits. According to Dr. Dean, when you are under serious physical and even emotional stress, your body may not be producing a sufficient stomach acid, which is required for digestion and for chemically changing magnesium into an absorbable form. In other words, when you are stressed your ability to absorb and utilize oral forms of magnesium is compromised. Fortunately, magnesium lotion is applied topically and does not have to deal with the GI tract. The benefits of magnesium are numerous. However, you actually have to absorb the magnesium to derive maximum benefit (or for many any benefit) so why even bother chancing it with oral magnesium? Magnesium Oil is inexpensive and should be part of your health routine today. **Above info from Dr. Dean's outstanding book "The Magnesium Miracle"
Magnesium oil isn't actually an oil after all but instead was coined as such due to the high saturation of magnesium chloride in water, which presents itself in an oil-like texture. If you are over 150 but less than 200lbs start with 10 sprays 2x per day. If over 200lbs go to 15 sprays 2x per day. 10 sprays equals 88mg of magnesium, 10mg of zinc, 102mg of MSM. 15 sprays equal 132mg of magnesium, 15mg of zinc, and 153mg of MSM. How do I use Aggressive Strength Recovery Oil? Apply to clean skin first thing in the morning and before bedtime. I find the legs, arms, and lower back are the best areas to apply it. You can wash the oil off after 30 minutes as that is all it takes for absorption. Start with a low dose such as 2 sprays to test tolerance before going to the optimal dose. What are the Benefits of Aggressive Strength Recovery Oil? I experience some tingling when I apply the Oil. Is this normal? Some users of the oil who have sensitive skin may experience tingling and/or some slight irritation at the site of application due to the high concentration of magnesium chloride. This effect is completely harmless and can vary based on a number of factors, including where you apply it on the body and how much you are applying. Diluting the oil 1:1 with pure spring water can reduce this effect, although it is a matter of personal preference. Additionally, those who do experience this effect report that the tingling lessens with each subsequent application. Rinsing the oil off after use is a matter of personal preference, and depends on how much you are applying and where. Typically, the more magnesium oil or gel one uses per application, the more likely it will be that you will want to rinse it off after the 20 minutes or so it takes for your skin to take full advantage of the magnesium. Are there any precautions for using Aggressive Strength Recovery Oil? Avoid using the oil near mucous membranes such as the eyes and nose, which can cause some irritation. Also, while applying the magnesium oil and/or gel to broken skin or wounds can be highly therapeutic and cleansing, the high concentration of magnesium salts can cause discomfort. How does the oil in your supplement compare with other topical magnesium products on the market? All ingredients are supplied by Ancient Minerals which is the manufacturer of the highest quality magnesium oil on the market. Ancient Minerals magnesium products are produced with very strict quality standards, from the purity of the raw ingredients to the production of the finished product. Other manufacturers utilize inferior forms of magnesium from impure ocean deposits and contaminated inland water sources. Ancient Minerals topical magnesium products are recommended by healthcare professionals the world over, and the only topical magnesium brand recommended by Dr. Mark Sircus, Ac., OMD, author of the book Transdermal Magnesium Therapy and director of the International Medical Veritas Association. Ancient Minerals is also the only topical magnesium brand formulated using the exclusive Genuine Zechstein Magnesium Chloride source. If you're under 150lbs, use 5 sprays 2x per day. Over 150 but less than 200lbs start with 10 sprays 2x per day. If over 200lbs go to 15 sprays 2x per day. 10 sprays equals 88mg of magnesium, 10mg of zinc, 102mg of MSM. 15 sprays equals 132mg of magnesium, 15mg of zinc, and 153mg of MSM. When should I take the Recovery Oil? Apply to clean skin after morning shower and before bedtime. I find the legs, arms, and lower back are the best areas to apply it. Avoid using it on the face or any other sensitive area. You can wash the oil off after 30 minutes as that is all it takes for absorption. Is there anyone that should not take the recovery oil? one to two months depending on how much you use. All orders placed on Sunday to Thursday are shipped within twenty-four hours. USA orders are shipped by USPS priority mail and delivered on an average of five business days. Orders to Canada are delivered within 7-10 days on average. Orders sent to Europe generally take two week and orders sent to Australia and Asia take 3-4 weeks. Yes like every product I carry if you are not happy with the recovery oil then send it back within 30 days for a full refund on the purchase price. 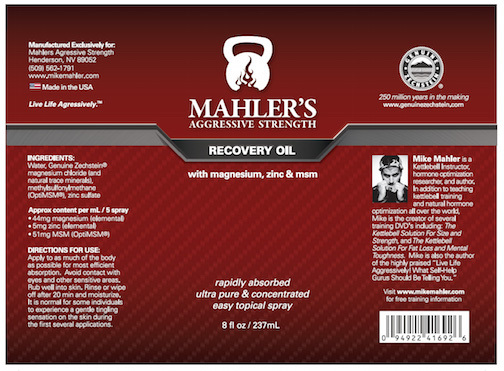 Mahler's Aggressive Recovery Oil is my new addiction! Debilitating insomnia had left me battling excessive fatigue and a lack of vitality. Constant muscle soreness impaired my ability to work out at the intensity level I desired. I have tried countless supplements from some of the best nutraceutical companies out there, and yet I was unable to conquer these health demons. A month ago, I stumbled upon a radio interview of Mike Mahler- he spoke of the necessity to add an absorbable form of magnesium to enhance hormone optimization. His interview put all the pieces of the puzzle together, and I ordered his Recovery Oil. I have been taking this now for four weeks- the insomnia has disappeared - this has resulted in energy and vitality. The muscle soreness is much less than it has been and I now look forward to working out at a more intense level. Additionally, I have been going through some intense stress and this magnesium oil has brought me calm and an ability to deal with it more effectively. Anyone who is serious about achieving optimal health needs Mahler's Recovery Oil in their arsenal! Can't say enough good things regarding the product! Because of a Dr's recommendation, I starting using a Magnesium product to help with headaches. I have used a big brand ZMA product in the past, but the feeling just doesn't compare! Not only is sleep more restful, but the overall recovery is off the charts. Moreover, what Mike stands for, the customer service and quick turn around from order to delivery is beyond comparison. THANK YOU! I have been following various forms of Mike's content on the internet for a number of years now, so I figured I could trust the integrity of his claims for the benefits of his Recovery Oil. The truth is, I think he was being a little too humble in his ad copy. This stuff has far exceeded my expectations! I have injured my left Achilles tendon in the past and it tends to inflame after intense bouts of plyometric/jumping movements. If I just massage two sprays of this on the site, the irritation leaves in far less than the 20 minutes Mike claims. Oh yeah, and don't even get me started on the beautiful quality of sleep I've been getting after a few weeks of using this. I have used your products going on 2 years now and absolutely love them, My favorite is the oil. The first time I used your Recovery oil I was barely able to walk (12 Mile Ruck 60lb pack rugged terrain) and after about ten sprays each leg the next day I barely felt a thing. I also get "dead to the world sleep" after using it at night. Since using the Recovery Oil, my sleep has gotten much deeper and more restorative! I'm doing a very neurologically taxing routine to build back my strength and muscle (Doggcrapp or DC Training). I've done it before and it has always dramatically improved my strength. However, it absolutely FRIES me about four-six weeks in. This time, it feels different. I'm not as sore and my neuromuscular overload is much more manageable! I've even gotten my girlfriend to try it and so far she's reporting that she has less DOMS than usual! Four years ago, I started training Tae Kwon Do with Jon Hinds' teacher. In the past six months, I have been slowing down due to intense joint pain. I have tried at least six supplements from OTC to turmeric with varying success. I always hurt. I caught a podcast where you and Sincere talked about getting serious about recovery. I ordered the Recovery Oil and Day 1, best sleep in years. Days 2-5, I can do what Sensei recommends: 100 PU day, 100 squats plus my dojo training. I can hardly wait to see what happens as my body continues to heal and rest. Thank you for a product that really works! I was hooked on sleep aids, both over the counter and prescription. Even while using those I would wake up 2 or 3 times a night. In addition to my dog barking at 5 am like clock work. I started using the recovery oil and noticed a big difference in the quality and deepness of my sleep. Now I sleep right through the noise and wake up refreshed. The recovery oil is amazing. I am 51 years old and have trained for 30 years. I recently started BJJ and I roll with guys 20-30 years old. At first, it was really hard because I was so sore after training. After I started using your recovery oil, my soreness went away sooner and I am gaining muscle. Excellent product. I cannot thank you enough for the Recovery Oil! I am a 53-year-old perimenopausal female. I want to share my story because I feel that other perimenopausal women might benefit from it. I was a highly-active outdoor and fitness enthusiast, but no longer had the physical or mental energy to do the things I loved or even day-to-day tasks. I was ill due to severe anemia from extremely heavy menstrual cycles. They became so heavy that I eventually hemorrhaged and took a trip to the emergency room. After that incident, I opted for ablation surgery to rectify the heavy bleeding. Because I was no longer losing so much blood every month I recovered from the anemia. But, I still had other lingering perimenopausal symptoms such as brain fog, low energy, and erratic sleep. I went to an ND for hormone testing. The supplements she put me on haven't been very effective and my sleep actually became worse. I returned to your website to review a video on hormone balancing and discovered the Recovery Oil. A friend had just told me she was using magnesium powder to help her sleep so I bought a bottle. Within a week I started seeing results. It has been about a month now and I am absolutely thrilled with the results! I am falling asleep quicker and sleeping like a rock. I no longer have brain fog in the mornings. I wake up excited, energetic, and ready to seize the day! And, best of all, I have sustained energy and enthusiasm throughout the day and right on into the evening! I feel like my old self again! It has been several years since I felt this great! During the years while I was ill many things in my life spiraled out of control or went by the wayside. I really feel like I have my life back and am so thrilled that I have the energy to start working out again and to get my body and my life back in shape! My heartfelt gratitude, appreciation, and thanks go to you, Mike!!! As a Combat Conditioning Coach, I am active all day long, both with my own training, and that with my athletes for 20 years-I have used Magnesium Oil in the past and had good results with it, but Mike's Recovery Oil is outstanding! My sustained energy throughout the day is high, recovery is quick, and my sleep is much better since using this. Also, Mike's Kettlebell course is highly recommended for Fighters- this is strength and mobility you can benefit from. recovery is one of my primary focuses. I've been following you since 2003, and I've used both the magnesium lotion and then the magnesium oil with good success, but your formulation surpasses both easily. I call this oil, "Lights Out" I work out in the evenings, later applying the oil all over, leaving it on for 20 to 30 minutes. After a warm shower, gotta tell ya, it's lights out for me. It puts me down and I sleep like a baby, which not only boosts my recovery (what could be better?) but also ensures that I'm full of energy and very focused and alert the next day due to such quality rest. And my recovery is MUCH quicker than normal. Little if any soreness and plenty of energy and motivation since concentration is at full capacity. Just wanted to say that it's been about 5 days into the Recovery oil and it's definitely a step up above the Mag oil, two things I notice are that the nagging injuries that I seem to get here in the knees and elbows have diminished quite a significant amount. The second thing I notice is with the new sprayer all I need is 5 sprays and I'm good to go, I strongly recommend this product to anyone that does heavy/strenous lifting. Five sprays before you lift is all you need, it's a damn good investment! Mike I feel kinda silly writing this because it sounds like a "yeah right" deal. The outside of my left wrist has been really sore, not sure if its the joint or inflamed, used my first app of Recovery Oil this morning and rubbed some into my wrist and I swear to God it feels much much better not nearly as tender. Thanks. Before August 2012 I was performing twenty 36 kg. snatches in each arm. On August 14 I had a bad crash in my pickup. Kettlebell training kept my body strong and safe even though I was physically stressed by the crash. After the crash I did not have the reps in me. On 08-25-12 I received the new oil and began using it. On 08-28-12 I performed really strong snatches with the 36 kg. bell for 20 reps. I may have had more if not for the fact that I psyched myself out. As a Deputy Sheriff patrolling one of the largest Counties in the U.S.A. I will tell you fitness is important. Mike, thanks for your programs. Reduce soreness, sleep deeper, and improve recovery! Mahler's Aggressive Recovery Oil is my new addiction! Debilitating insomnia had left me battling excessive fatigue and a lack of vitality. Constantmuscle sorenessimpaired my ability to work out at the intensity level I desired. I have tried countless supplements from some of the best nutraceutical companies out there, and yet I was unable to conquer these health demons. A month ago, I stumbled upon a radio interview ofMike Mahler- he spoke of the necessity to add an absorbable form of magnesium to enhance hormone optimization. His interview put all the pieces of the puzzle together, and I ordered his Recovery Oil. I have been taking this now for four weeks- the insomnia has disappeared - this has resulted in energy and vitality. The muscle soreness is much less than it has been and I now look forward to working out at a more intense level. Additionally, I have been going through some intense stress and this magnesium oil has brought me calm and an ability to deal with it more effectively. 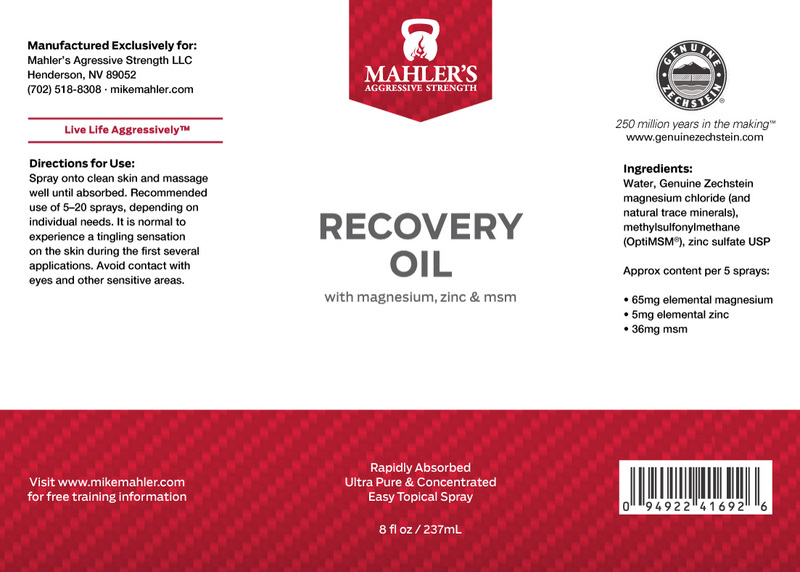 Anyone who is serious about achieving optimal health needs Mahler's Recovery Oil in their arsenal! Can't say enough good things regarding the product! Because of a Dr's recommendation I starting using a Magnesium product to help with headaches. I have used a big brand ZMA product in the past, but the feeling just doesn't compare! Not only is sleep more restful, but the overall recovery is off the charts. Moreover, what Mike stands for, the customer service, and quick turn around from order to delivery is beyond comparison. THANK YOU! Since using the Recovery Oil, my sleep has gotten much deeper and more restorative! I'm doing a very neurologically taxing routine to build back my strength and muscle (Doggcrapp or DC Training). I've done it before and it has always dramatically improved my strength. However it absolutely FRIES me about four-six weeks in. This time, it feels different. I'm not as sore and my neuromuscular overload is much more manageable! I've even gotten my girlfriend to try it and so far she's reporting that she has less DOMS than usual! Four years ago, I started training Tae Kwon Do with Jon Hinds' teacher.In the past six months, I have been slowing down due to intense jointpain. I have tried at least six supplements from OTC to turmeric withvarying success. I always hurt. I caught a podcast where you andSincere talked about getting serious about recovery. I ordered theRecovery Oil and Day 1, best sleep in years. Days 2-5, I can do whatSensei recommends: 100 PU day, 100 squats plus my dojo training. Ican hardly wait to see what happens as my body continues to heal andrest. Thank you for a product that really works! I was hooked on sleep aids, both over the counter andprescription. Even while using those I would wake up 2 or 3 times anight. In addition to my dog barking at 5 am like clock work. Istarted using the recovery oil and noticed a big difference in thequality and deepness of my sleep. Now I sleep right through the noiseand wake up refreshed. This is my secondtime ordering your recovery oil, and I feel like I can'tsay enough about how much it's helped my performance.Lifting in the morning, working all day, then going to MMAat night left me constantly fatigued, and I had difficultystaying awake and focused atwork until I started using this product. The benefits wereapparent within 2 days of using it. If there is onesupplement I swear by, this is it! I sleep better at nightand have energy all day. The recovery oil is amazing. I am 51 years old and have trained for 30 years. I recently started BJJ and I roll with guys 20-30 years old. At first it was really hard because I was so sore after training. After I started using your recovery oil, my soreness went away sooner and I am gaining muscle. Excellent product. I cannot thank you enough for the Recovery Oil! I am a 53 year old perimenopausal female. I want to share my story because I feel that other perimenopausal women might benefit from it. I was a highly-active outdoor and fitness enthusiast, but no longer had the physical or mental energy to do the things I loved or even day-to-day tasks. I was ill due to severe anemia from extremely heavymenstrual cycles. They became so heavy that I eventually hemorrhaged and took a trip to the emergency room. After that incident I opted for ablation surgery to rectify the heavy bleeding. Because I was no longer losing so much blood every month I recovered from the anemia.But, I still had other lingering perimenopausal symptoms such as brain fog, low energy, and erratic sleep. I went to an ND for hormone testing. The supplements she put me on haven't been very effective and my sleep actually became worse. I returned to your web site toreview a video on hormone balancing and discovered the Recovery Oil.A friend had just told me she was using magnesium powder to help her sleep so I bought a bottle. Within a week I started seeing results. It has been about a month now and I am absolutely thrilled with the results! I am falling asleep quicker and sleeping like a rock. I no longer have brain fog in the mornings. I wake up excited, energetic, and ready to sieze the day! And, best of all, I have sustained energyand enthusiasm throughout the day and right on into the evening! I feel like my old self again! It has been several years since I felt this great! During the years while I was ill many things in my life spiraled out of control or went by the wayside. I really feel like I have my life back and am so thrilled that I have the energy to start working out again and to get my body and my life back in shape!My heartfelt gratitude, appreciation, and thanks go to you, Mike!!! As a Combat Conditioning Coach, I am active all day long, both with my own training, and that with my athletes for 20 years-I have used Magnesium Oil in the past and had good results with it, butMike's Recovery Oil is outstanding! My sustained energy throughout the day is high, recovery is quick, and my sleep is much better sinceusing this. Also, Mike's Kettlebell course is highly recommended for Fighters- this is strength and mobility you can benefit from. I've been following you since 2003, and I've used both the magnesiumlotion and then the magnesium oil with good success, but yourformulation surpasses both easily. I call this oil, "Lights Out"I work out in the evenings, later applying the oil all over, leavingit on for 20 to 30 minutes. After a warm shower, gotta tell ya, it's lights out for me.It puts me down and I sleep like a baby, which not only boosts myrecovery (what could be better?) but also ensures that I'm full ofenergy and very focused and alert the next day due to such qualityrest.And my recovery is MUCH quicker than normal. Little if any soreness,and plenty of energy and motivation since concentration is at fullcapacity. You always put out quality products Mike and you've outdone yourselfwith this one.All the very best to your continued success. Before August 2012 I was performing twenty 36 kg. snatches in each arm. On August 14 I had a bad crash in my pickup. Kettlebell training kept my body strong and safe even though I was physically stressed by the crash. After the crash I did not have the reps in me. On 08-25-12 I received the new oil and began using it. On 08-28-12 I performed really strong snatches with the 36 kg. bell for 20 reps. Imay have had more if not for the fact that I psyched myself out. As a Deputy Sheriff patrolling one of the largest Counties in the U.S.A. I will tell you fitness is important. Mike, thanks for your programs.